A Residential client is one that is renting physical office space in one of your buildings, for a longer term. In this guide, we will discuss how you can set up a new licence in Operate when acquiring such a customer. Start by following the general process of adding a new licence in Operate. While going through the steps in the linked guide, make sure to select Resident in the Client Type dropdown. 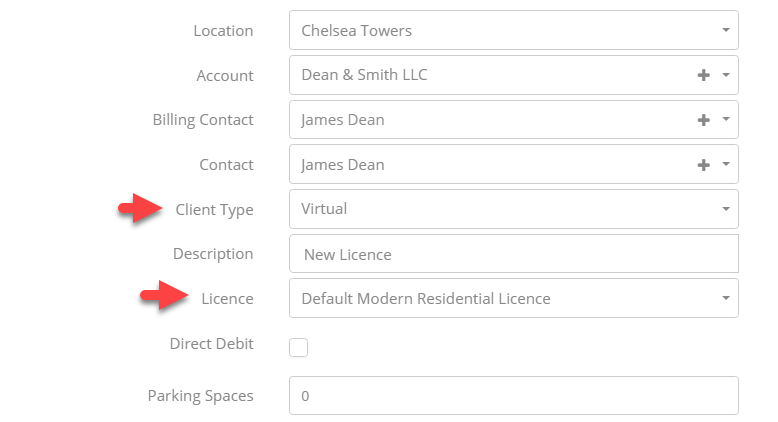 In addition, select a licence template that corresponds to the type of customer - in this example screenshot below, we are using a residential licence template to associate to this client. Complete the rest of your licence information until you reach the Office Schedule. The Office Schedule and the service list area is where you will need to add the office that the customer will be using.. Next, if your customer requires other contract services, you can add them under the Contract Services section. Virtual services can also be added to residential customers; however, please keep in mind that the physical space they rent is what makes them residents. If your customer doesn’t require office space and only needs virtual services, then it should be added as virtual. Please have a look at the dedicated guide on adding services to Operate licences.